"Sheriff Taylor, I gotta hand it to you. For a fella sworn to uphold law and order and decent living, you sure are a good sneak." The second season of one of television's most revered comedies arrives with another 31 hilarious episodes. Andy Griffith returns as the small town sheriff who along with his faithful, if fumbling, deputy, Barney Fife (Don Knotts) keep law and order in Mayberry, South Carolina. Boasting the lowest crime rate in the country, Mayberry may not seem like the place where much happens, but Sheriff Taylor and his cohort run up against a number of villains, from traffic infractions to bootlegging and gambling, which keeps the pair on their toes. This season contains three of the top rated episodes from the show's eight-year run, including the #1 fan favorite, The Pickle Story, which finds Andy dealing with Aunt Bee's notoriously awful homemade pickles by replacing them with store bought. The plan backfires when Bee decides to enter them in the county fair, which would cause heartbreak for her best friend and pickle queen, Clara (Hope Summers). Andy, Barney and Opie come to the rescue, but not without it putting a sour look on their faces. Another is Barney and the Choir, where the tone deaf deputy volunteers to join the town vocal group for a concert, but since no one has the heart to tell him how bad he is, Andy has to concoct a way of keeping him from performing. My personal pick has to be Andy on Trial, where a big city publisher with a vendetta sets out to destroy Andy by digging up whatever dirt he can find. Barney unwittingly supplies the ammunition while trying to impress a college student who is really an undercover reporter, which results in Andy facing losing his job, with Barney as the key witness. Knotts is brilliant in this episode, both as a braggart, and then in standing up for his partner. This is a great character episode. Andy continues to be his down home, soft spoken self, and while his heart is in the right place, he has no qualms about having a bit of fun at other people's expense, with Barney at the top of the list. At the same time, he does look out for the interests of his partner, especially when he knows Barney is getting in over his head. Where Knotts had plenty of great moments in the first season, his performance here has been kicked up a notch, with even more crazy antics derived from his character traits. His nose gets out of joint when a new man shows up in Barney's Replacement, which compels him to quit the force and take up as a door to door salesman. When one of Andy's friends invites them to visit a posh private club, Barney believes Andy may not be cut out to join�while he is. Mayberry's amazing low crime rate also inspires a neighboring town to solicit Barney as their new sheriff, so Andy decides to give him a taste of what the job entails. While the first season saw Andy wooing the young Ellie, there really isn't much in the way of a love life for the sheriff here, apart from a setup with Thelma Lou's cousin (The Perfect Female) and two episodes with different actresses playing the part of nurse Mary Simpson. Julie Adams takes the role in The County Nurse, where Andy is being ever so helpful in convincing a reluctant farmer, Rafe Hollister (Jack Prince), to get a tetanus shot, while Barney becomes a obstacle to Andy's courting in Three's a Crowd, guest starring Sue Ane Langdon. Aunt Bee isn't forgotten in the romance department, falling for a travelling handyman (Petticoat Junction/Green Acres regular Edgar Buchanan) who plays up her affections (Aunt Bee's Brief Encounter), then courting town launderer, Fred Goss (Fred Sherman), when she believes that her presence is interfering with Andy's love life in Wedding Bells for Aunt Bee. The supporting cast gets their time in the limelight as well. Opie has a few lessons to learn this time out as well, from dealing with a bully in the season opener, to how to be a good sport. Ronny Howard continues his brilliant portrayal of the young boy, with always the right question to get his father thinking. Floyd (Howard McNear) and Otis (Hal Smith) are also prominently featured in a few episodes. There are a number of recognizable faces appearing in guest starring roles. Jean Hagen (Make Room for Daddy) makes life difficult for Andy after refusing to pay a speeding ticket. Buddy Ebson (The Beverly Hillbillies) plays a hobo who has a poor influence on Opie; Alan Hale Jr. (Gilligan's Island) is a farmer with an unrealistic expectation as to how to get himself a wife; Bill Bixby (My Favorite Martian) is a rich kid who finds himself behind bars for speeding (Bailey's Bad Boy); Barbara Eden (I Dream of Jeannie) opens a manicuring service in Floyd's barbershop (The Manicurist); Allan Melvin (The Brady Bunch) makes dual appearances, first, in Jailbreak then as a house detective Barney mistakes for a jewel thief (Andy and Barney in the Big City) and Michael Pollard (Bonny and Clyde) costars as Barney's clumsy Cousin Virgil. 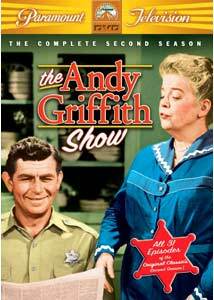 The show has lost none of its charm, and even today, The Andy Griffith Show is sure to put a smile on your face. Image Transfer Review: The second season bests the first in terms of overall quality, as these episodes look go-ood! Greyscale is nicely rendered, with nice midtones and good low level and fine detail. The image is clean with very few blemishes. There are some minor defects here and there, and contrast is a little high on a few episodes, but overall this looks great. There are no cross-coloration problems and none of the interlace artifacting found on the first set. The scant deficiencies don't really warrant a downgrade. Audio Transfer Review: The mono audio sountrack is clear and clean, and while not demonstration level, fits the programming perfectly. There is a minor amount of hiss, but there were no other technical deficiencies noted. 6 Other Trailer(s) featuring The Brady Bunch, Happy Days, Laverne and Shirley, Mork and Mindy, MacGuyver, Charmed. Extras Review: While there isn't an abundance of extras, I am thrilled to have the show's original sponsor spots included, which follow the theme of the episode. Andy and company pitch Sanka (including their new "easy to hold jar") and a collection of Post cereals. These are presented with their own submenu both individually and with a "Play All" feature. Each episode has five internal chapter stops, including one immediately following the opening theme, and once again the original CBS iris slug is included at the end. The first disc has front loaded trailers for The Brady Bunch, Happy Days, Laverne and Shirley, Mork and Mindy, MacGyver and Charmed. The set comes housed in three thinpaks—two duals and one single—in a box. The discs are single sided and easy as pie to figure out which is which. Episode synopses are included on the interior of the cases. The Andy Griffith Show remains one of the all time greatest television sit-coms, and even though this season rated the lowest of all eight during its initial run, there is still a whole lot of fun to be had here, and Paramount continues to deliver a quality presentation. Highly recommended.